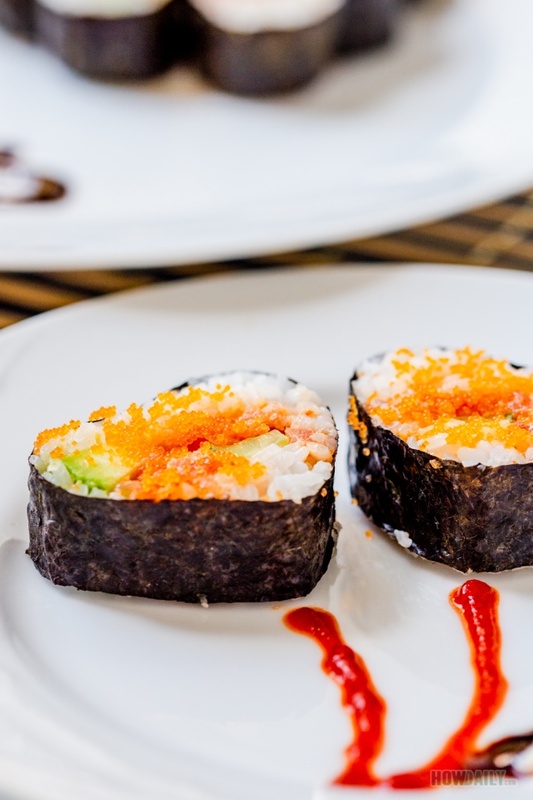 If you like sushi and can take the raw, this is one of those rolls you must try: the dynamite sushi roll. This dynamite sushi roll consisted of raw tuna, masago, cucumber and avocado as filling and flavor with sriracha and mayo (spicy mayo). Though vary from one restaurant to another, taste, nonetheless is delicious. As stated, I used cucumber and avocado for veggies, but you can use any substitution, like pickle radish, cabbage, lettuce… The most important thing here is choosing fresh ingredient. That’s mean fresh veggies and tuna. Look at your local Japanese or oriental market for sushi-grade fish that ready-cut in block. It’s just less work to do and easier to portion. The whole preparation and rolling/molding should be less than 20 minutes as there is no cooking involved. Just mixing, chopping and slicing, that’s all. I used Sriracha mix with mayo to have the spicy mayo flavor over diced tuna and masago. I also added a little bit of rice vinegar to the mixture, just personal preference. 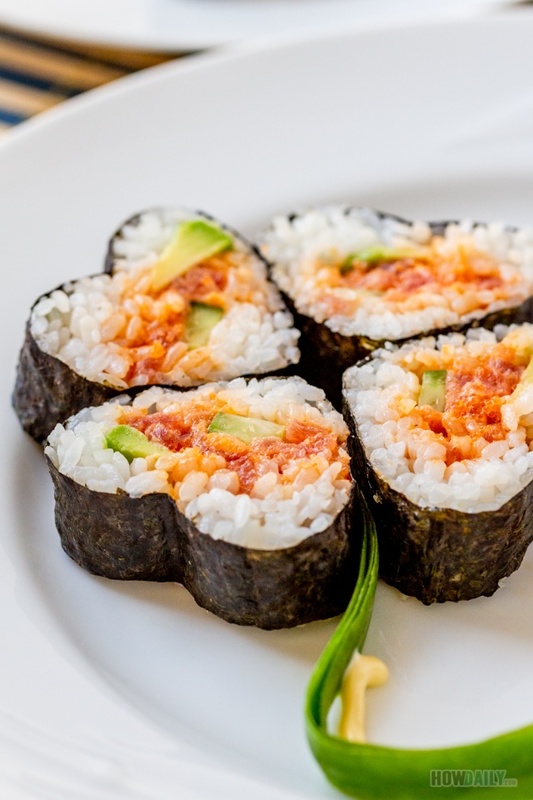 You can roll this like normal maki roll, or inverse them as uramaki. Or if you have trouble with rolling, try some of these sushi tool kits and you will be able to make neat and tidy looking sushi in no time. Take a closer look at the box molding, as that was what I used as demo for this dynamite roll. Finely dice or chop sushi-grade tuna. (optional) To enhance the flavor, you can also add 1 Tbsp rice vinegar and chopped scallion to the mix. Thinly slice cucumber and avocado. On a flat surface, place the mold cutting guide over its base to create an rectangular molding box. Place a sheet of nori inside the cutting guide with the grainy side facing upward. Gently use your finger to pull the nori down and indent inside the molding box without breaking it. Fill molding box to with sushi rice to about 1/3 of its depth. Use your fingers or small spatula to spread the rice evenly. 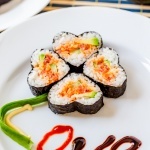 Spoon in the spicy tuna filling, then arrange cucumber and avocado slice. Fill the box with sushi rice to cover all the fillings. Gently tuck to close and seal the nori ends by dabbing rice vinegar-water to adhere (1:1 ratio). 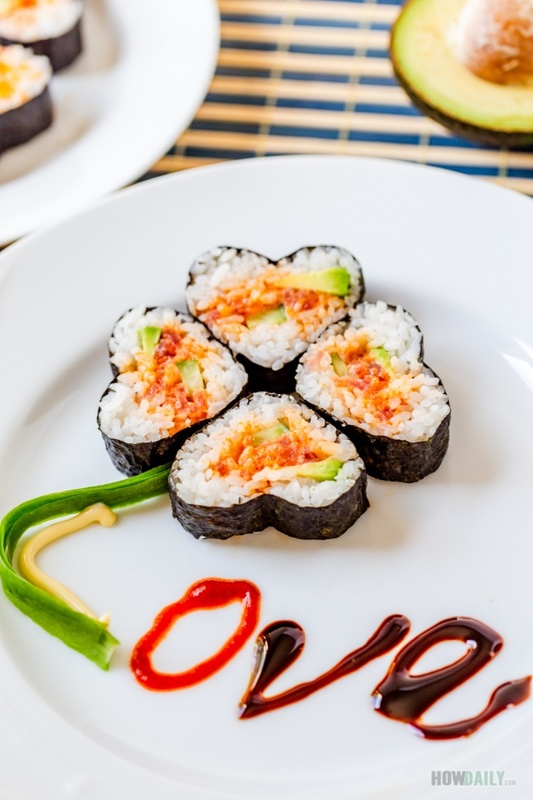 Now choose the heart shape lid to place over top maki roll. Press and apply pressure evenly to the lid to mold the sushi roll beneath. Carefully remove the lid (without breaking the roll). Use a sharp dedicate knife to cut sushi roll follow the cutting guide. Replace the top lid back onto the roll. Apply some pressure just in case your roll get shuffle during cutting. While pressing the lid, carefully remove the cutting frame. Flip the roll along with lid/base upside down, so now the lid with be on the bottom and base on top. Gently tap the base a few times to release sushi pieces. Carefully handle and arrange these pieces on serving dish.